So well known as to scarcely need any description, these large, stout fan palms are popular subjects for cultivation all around the world. Given sufficient water they are very fast growing, and this fact is not lost on those who plant for public display, to the extent that it is somewhat over-used. It is often described as drought tolerant; however, this does not mean that it can survive without water. In the wild it invariably grows near permanent water and its long roots grow deep underground to tap the residual moisture there. 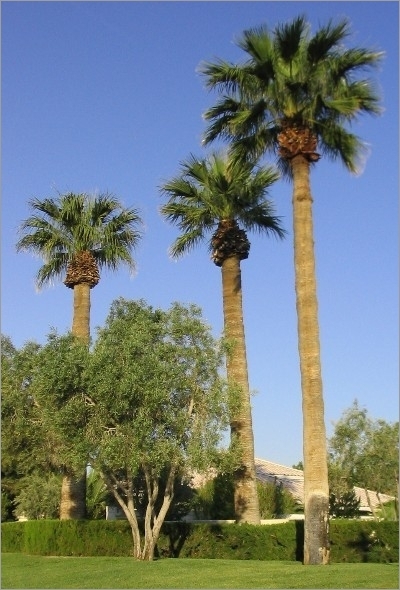 The Washington Palm is best suited to dryer, temperate or subtropical climates. It can take quite heavy frosts with little damage. There is probably no palm whose seeds are cheaper and easier to sprout.